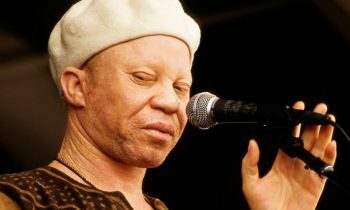 Salif Keita is a Mandingo Afro-Pop singer and song-writer from Mali. He celebrated his 67th birthday on August 25, 2016. His golden voice is well-known throughout Africa. Some of his classic songs include Yamore which was a collaboration between Keita and the late great Cesaria Evora. His haunting melodies always evoke images of home (Africa) for us. Aside from his voice, Keita’s albinism makes him distinct. In his 2009 album La Difference, he urges us to understand that different does not mean bad. Salif Keita is descended from Sundial Keita who founded the Mandingo empire in the 13th century. From all of us at Squinti African Art, we wish the “Golden Voice of Africa” a happy 67th birthday.